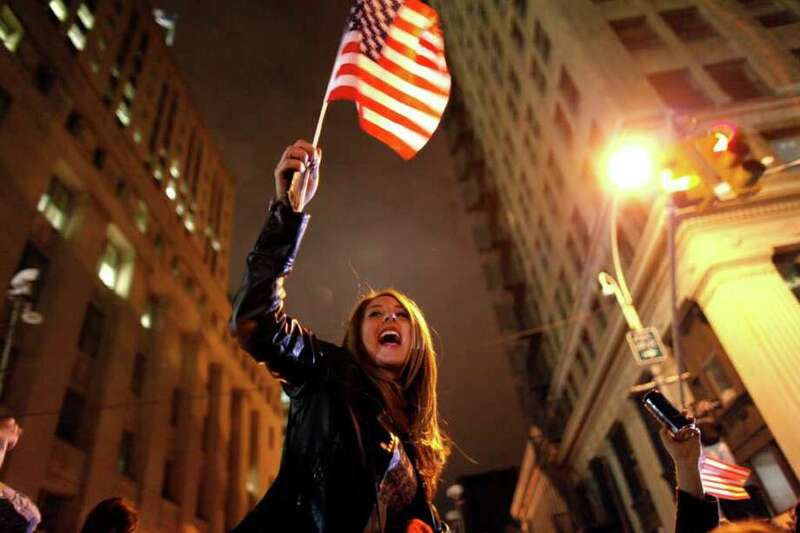 A large, jubilant crowd reacts to the news of Osama Bin Laden's death at the corner of Church and Vesey Streets, adjacent to ground zero, during the early morning hours of Tuesday, May 2, 2011 in New York. Crowds gathers outside the White House in Washington late Sunday, May 1 2011, to celebrate after President Barack Obama announced the death of Osama bin Laden. Draped in the American flag, Pedro Valerio, of Elizabeth, N.J., right, and others in New York's Times Square react to the news of Osama Bin Laden's death early Monday morning May 2, 2011. United States military troops watch the announcement by President Barack Obama that Osama bin Laden had been killed, at the USO at Kandahar Airfield, southern Afghanistan, Monday, May 2, 2011. Crowds gathers outside the White House in Washington early Monday, May 2, 2011, to celebrate after President Barack Obama announced the death of Osama bin Laden. Pat White arrives at the Texas Capitol in Austin, Texas Sunday night, May 1, 2011, to celebrate Osama bin Laden's death. Crowds celebrate on Pennsylvania Avenue in front of the White House in Washington, early Monday, May 2, 2011, after President Barack Obama announced that Osama bin Laden had been killed. A man sits on a bench a the Pentagon Memorial early Monday, May 2, 2011, at the Pentagon in Washington, after President Barack Obama announced the death of Osama Bin Laden. The Pentagon Memorial is seen early Monday, May 2, 2011, at the Pentagon in Washington, after President Barack Obama announced the death of Osama Bin Laden. Climbing trees, crowds celebrate on Pennsylvania Avenue in front of the White House in Washington, early Monday, May 2, 2011, after President Barack Obama announced that Osama bin Laden had been killed. Secret Service Police watch the crowd celebrating outside the White House in Washington early Monday, May 2, 2011, after President Barack Obama announced the death of Osama bin Laden. People celebrate at ground zero in New York Monday May. 2, 2011 after President Barack Obama announced Sunday night, May 1, 2011, that Osama bin Laden was killed in an operation led by the United States. Las Vegas locals gather outside of New York New York Hotel and Casino in reaction to news of Osama bin Laden's death, Sunday, May 1, 2011 in Las Vegas. People cheer and wave flags on the "Freedom Bridge" just outside Joint Base Lewis-McChord, Sunday, May 1, 2011, near Tacoma, Wash., after they heard the news that Osama bin Laden had been killed.